For Thanksgiving, I posted a note on my Facebook page thanking readers for their support. Without you, I would not have won a book publishing contract with Hay House, and written my book, Sole Guidance, from my heart and soul. I invited readers to comment and ask questions, but I wasn’t sure what to expect given it was the holidays. I set aside time during my Thanksgiving celebration to answer everyone’s comments and I was TOTALLY BLOWN AWAY by your kindness, generosity and spirit. Thank you, thank you, thank you. 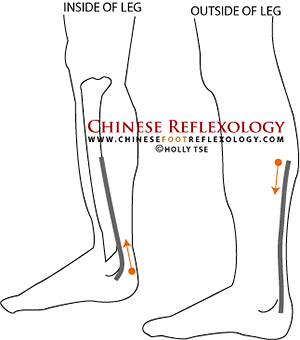 One person asked me if there were any Chinese reflexology points for sciatica. As I typed out my response, I realized that the answer would be of interest to a lot of people. Plus, that tiny space on Facebook really didn’t give me much room to share, so I decided to write an article on how to massage reflexology points for natural relief from sciatica. Let’s first begin by looking at what causes sciatica because that’s what can help you “cure” sciatica. By the way, I wrote “cure” with quotes around it because I don’t subscribe to the idea of curing diseases. That puts too much emphasis on the disease and addressing its symptoms. It’s much better to focus on health and wellness because when you restore balance, your body naturally heals itself regardless of whatever label may be affixed to your dis-ease. It’s no wonder that sciatica suffers can sometimes feel like their pain is crippling. Sciatic pain can be caused by injury, disease, or even pregnancy. Things like degenerative discs, herniated discs, or any type of injury that causes the vertebrae to slip out of alignment can put pressure on the sciatic nerve. That’s why even pregnancy can cause sciatic pain because the growing fetus puts pressure on the lower back. Treatment usually involves either suppressing the pain, or alleviating the pressure on the nerve. The Chinese Medicine perspective is much more holistic. It takes a step back to identify the root cause. Why is someone prone to degenerative or herniated discs? Why does one woman have no issues during her pregnancy and another does? The root cause that makes someone more susceptible to sciatica is a weakness in their body constitution, specifically related to the Kidney meridian. In Chinese medicine, it is said that the kidneys control the bones. The Chinese Medicine perspective on organs is much broader than the Western perspective in that it includes not just the organ, but also its associated energy meridian, its yin and yang elements, and for the Kidneys, it also includes something called Kidney Jing. This is basically your life force energy. When this is weak, it can manifest as weakness in the bones resulting in greater susceptibility to the type of misalignment that results in sciatic pain. While we could stop right here and focus on strengthening the Kidneys, true healing is not just about the mechanics and energy of the body. There’s a reason why someone’s life force energy is low. It’s because of the choices they make in their lives—past, present, and future. Your cumulative choices create your health and vitality. Louise Hay is a pioneer in the mind body connection, linking emotions and fears to diseases and ailments. As the author of You Can Heal Your Life (a book I highly recommend), she states that the mental roots of sciatica are being hypocritical, a fear of money, and/or a fear of the future. Taking a step back (bad pun intended), I believe that anything related to the legs—including the hips, knees, ankles, and feet—is related to a fear of moving in a new direction. If we look closer at what Louise Hay says about sciatica being linked to being hypocritical, what is hypocrisy other than saying one thing and moving in a totally different direction than what you actually say? The fear of (lack of) money and of the future is also interesting to examine more closely because the sciatic nerve runs down the back of the legs and buttocks. It overlaps with two energy meridians: the Bladder and the Gall Bladder. In Chinese Medicine, organs are associated with different emotions. In the case of the Bladder meridian, it has a strong relationship with the Kidney meridian, and the emotion associated with the Kidneys is fear. The Gall Bladder is associated with decisiveness when in balance, and indecisiveness when not in balance. Coincidence? I think not :). Any disease or ailment in the body is a message from our souls communicating through our bodies. Ailments are a literal manifestation of the choices, thoughts, and beliefs that are contrary to our true nature and brilliance. In the case of sciatica, when you consider the length of this nerve and how it goes through your legs, and how the pain can stop you in your tracks, it is a literal manifestation of being unable to move forward in life, of being crippled with fear. Our souls are calling us to move forward, but the fear of change is so great that you are literally rooted to the spot with pain. So, if you really want a “cure,” you have to shift your mindset and thinking to release the thought patterns and beliefs that stop you from moving forward, and that are crippling you with fear. While shifting your mindset is critical for releasing disease or pain, that’s a little bit more than I can cover in this article. I do however address it in great detail in my book, Soul Guidance: Ancient Secrets of Chinese Reflexology to Heal the Body, Mind, Heart, and Spirit. But there are things you can do right now to shift your mind for healing. You see, while the mind affects the physical body, it also works the other way around. The physical body can also affect the mind—especially when you practice energy healing such as Chinese reflexology. 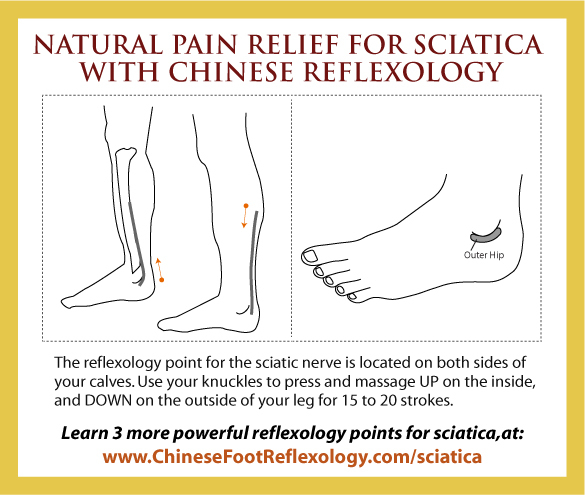 So I’m going to show you some Chinese reflexology points that can help give you natural relief from sciatica pain. They can also start you on your path of healing so that you can move forward in life with less fear. As you massage these points, you’ll be shifting the energy in your body. And these shifts will help you shift your mindset and let go of fear so that you can move forward with more ease and flow. So, let’s get moving with four powerful reflexology points . . . The first point that we’ll look at is the sciatic nerve point. Next, we’ll look at two hip reflexology points, which are absolutely critical to massage, too. Finally, I’ll share more with you about the Kidney’s role in restoring balance so that you can release sciatic pain. This is technically not a reflexology point on the foot, but instead a couple of energy “lines” that run along the lower portion of your leg—they run somewhat parallel to the sciatic nerve. So, there’s a line on the inside of the lower leg, and one on the outside. On the inside of the leg, the line begins behind your ankle and follows underneath your tibia bone (the big bone on the inside of your calf) until below the knee. On the outside of your leg, the line starts below the knee and follows under the fibula bone (the smaller leg bone on the outside of your calf) until you reach behind your ankle. To massage these lines, stand with one foot on a chair or stool, like you’re taking a step up. Then, reach down with your hands on either side of your calf. On the INSIDE of your leg, place your index finger knuckle behind the ankle and trace UP your leg, following under the crest of the shin bone until you reach your knee. On the OUTSIDE of your shin, place the index finger knuckle of your other hand below the knee and feel for the underside of the crest of the fibula bone. Trace DOWN your leg, following the bone, until you reach the back of the ankle on the outside of your foot. Always go UP on the inside and DOWN on the outside. Massage 15 to 20 strokes twice a day on both legs, both sides, being mindful of the proper direction to stroke. You’ve got two hip points to massage—the first is for the inner hip and the second is for the outer hip point. These hip points are covered in much more detail in my book and also in my Sole Fundamentals: Introduction to Chinese Reflexology program. For this article, let’s get you started with a quick overview. The inner hip reflexology point is shaped like a curved tube of macaroni between the elbow style and penne. To locate this point, take your thumb and feel for the slight indentation under and behind your anklebone. To massage this point, apply a bit of lubricant such as massage oil or moisturize. This will help to reduce friction because when you rub this area, you don’t want to irritate the skin on the edge of your foot, which is much more delicate and sensitive than the sole of your foot. The Chinese reflexology point for the outer hip is similar to the inner hip, only you’ll find it behind and below the outer anklebone. Use your index finger to feel for the indentation and massage this area back and forth for 15 to 30 seconds 3 to 4 times a day. As the skin is sensitive here too, use a dab of massage oil or lotion to reduce friction when massaging this area. If you notice any weird sensations like you’re hitting a nerve, you’re probably hitting a nerve. In that case, use less pressure and massage for no more than 15 seconds. In addition to controlling the bones, it is said that the Kidneys produce marrow and fill up the brain. Here, the concept of marrow goes beyond the western perspective of bone marrow, and also encompasses the materials that make up the brain and spinal cord. Thus, you could extrapolate that the Kidneys play a critical role in the nervous system and hence, the sciatic nerve. The Kidney point is the most powerful point in Chinese reflexology because the Kidneys play so many important roles in the body from controlling your bones to storing your life force energy, and much much more. The Kidneys are considered the root of life. Because they’re so vital to vitality, I created a special online lesson dedicated solely (bad pun intended) to the Kidneys where I teach how to locate and massage the Kidney reflexology point. By the way, did I mention the lesson is free? All you need to do to receive your free lesson is enter your email below. You’ll also receive free Chinese reflexology charts that you can download, a series of free online lessons (the Kidney point is lesson 3), as well as my monthly newsletter. I’ll also let you know about upcoming workshops and opportunities to learn more about Chinese reflexology. I promise to keep your email confidential and not share it with anyone. As a full-time mom, I’m much too busy to be spamming people, and I consider excessive emails to be rather uncouth. I promise that the messages you receive will be filled with gems of wisdom to help you and your family stay healthy and thrive. I am already subscribed, and would like to receive the free lesson on the Kidney Point…so please advise what steps I need to take in order to receive this lesson..
You should be set up to receive it within a day or two. If you don’t see the message, check your spam. Otherwise, find an old newsletter from me, unsubscribe and subscribe again. I’d like to be included in the kidney pint lesson, too, please. Thank you! What perfect timing as I seem to be experiencing alot of sciatica pain. I have been going thru fear of money and of the future. In other words you described me to a T! This confirms with myself exactly what you wrote, I must change the way I think. Easier said than done, but I will perservere. I wanted to thank you for your information, you have no idea how much you have already helped. You’re very welcome Cynthia :). It sounds like you know exactly what to do–you’re strong and empowered! Good for you! thank you so much Holly – your lessons are really helping me help myself and my family. Do you have a lesson on shoulder and arm pain? Particularly the right arm for a right handed person.